Almost every iPhone user with a low end phone has trouble with their storage capacity. If your iCloud storage is reaching its limit, and you don;t want to spend another dime on an iOS solution, you can make use of OneDrive. In this post, I’ll show you how you can easily connect your iOS camera roll to OneDrive to store all your 4K pictures and 1080 videos to the handy storage facility offered by Microsoft. If you use a Windows 10 PC, using OneDrive for all your storage requirements greatly helps. The OneDrive mobile app makes it easy to set up and use your iOS Camera roll to automatically upload your pictures and videos to the cloud. Plus, you’ll always have a handy backup solution in case you lose your data accidentally. Here’s how to set it up. 1. First, you’ll need to have the OneDrive app for iOS. If you don’t have the app, download it from the App Store. Its free to download and use. 2. 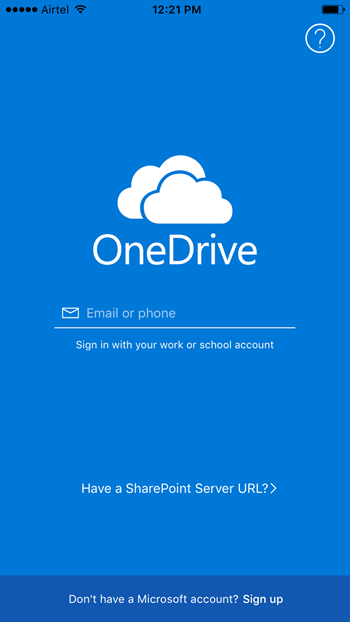 Launch the OneDrive app and sign in with your Microsoft account. If you don’t have a Microsoft account, you can create one here or use the link in the OneDrive app to create it. 3. Tap the Photos tab at the bottom of the screen to access your photo library. 4. At the top of the screen, in the Camera Upload section, tap Turn On. If OneDrive prompts you to give permission to access your photos, tap OK. You may also be required to grant or deny permission for OneDrive to send you notifications when anything is uploaded. You can always go to the Settings page you customize these notification settings. 5. The sync times will vary depending on the speed of your network and the size of your photo library. You can monitor the progress from the countdown message on the screen. That’s it. 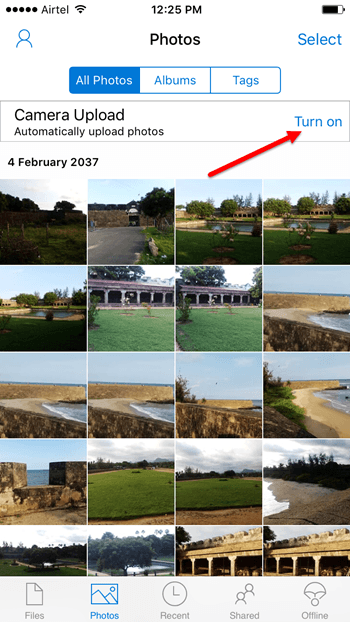 Your iOS pictures will now be uploaded to OneDrive automatically. You can access and sync your photos from any other device running OneDrive as well. You can also do direct upload of your photos to Dropbox, Google Photos and other cloud solutions, but since OneDrive comes pre-installed with Windows and you get as much as 1TB storage space, it seems a more logical choice to have your data backed up.